The Springtime March against euthanasia - Saturday, May 18. 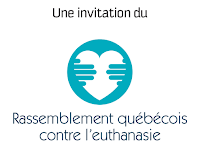 The Quebec Rally Against Euthanasia (QRAE) has revealed the details of what is turning out to be the largest mobilization against euthanasia since the Quebec government announced that it was planning to table legislation on « medical aid in dying ». Doctors, lawyers, handicapped persons, citizens from all corners of Quebec will take part in the family-friendly atmosphere of the Springtime March this Saturday May 18, in the provincial capital. 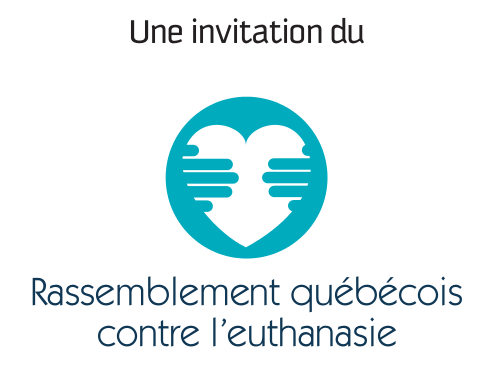 Dr. Claude Morin, head organiser of the March and emergency-room doctor, Dr. Marc Bergeron, hemato-oncologist, Louis-André Richard, philosophy professor, as well as Amy Hasbrouck from Toujour Vivant-Not Dead Yet, present this "citizens' initiative which is open to every person who is conscious of the danger which euthanasia poses to Quebec society." With the theme "Euthanasia, in our province? No thanks!" the crowds will gather at noon on Saturday, May 18. The day will begin with speeches on the Plains of Abraham, across from the Musée national des beaux-arts of Quebec. The March itself will get started at 1:45 pm and will head to the Parliament via the Grande-Allée. Speeches will be delivered throughout the day, which will end at around 4:30 pm in front of of the Parliament. The spokespersons for the QRAE invite the population to attend so that "every effort is taken so that the security, dignity and comfort of suffering persons at the end of life be assured by quality and universally accessible palliative care." "Euthanasia eliminates the patient, not the pain. We don't want it!" they affirm. Dr. Patrick Vinay, head of a palliative care unit and interim president of the Living with Dignity network, and Dr. Catherine Ferrier, member of the Physicians' Alliance for Total Refusal of Euthanasia, both from Montreal, as well as Alex Schadenberg, the executive director of the Euthanasia Prevention Coalition, extend to the organisers of the Springtime March the support of their respective organisations. They also confirm their presence at Saturday's March on May 18. Dr. Vinay observes that "Killing is not health care; it's the instant cessation of all care. We must instead care, relieve, help and appease all suffering." "We need a big turnout this Saturday May 18, to show clearly to our elected officials that there is no consensus in Quebec in favour of of "medical aid in dying" he added along with Dr. Catherine Ferrier. For more information on the Springtime March, consult the website at: http://www.EuthanasiaNoThanks.org or follow the Quebec Rally Against Euthanasia on Twitter, Facebook and Storify.